PennsylvAsia: Pittsburgh Dragon Boat Festival (匹茲堡龍舟節), September 30 at North Park. 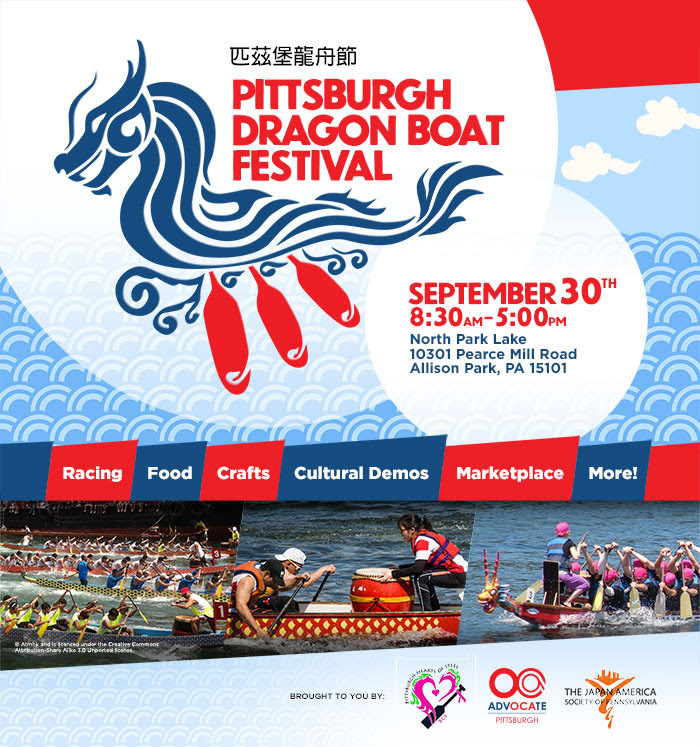 Pittsburgh Dragon Boat Festival (匹茲堡龍舟節), September 30 at North Park. The Pittsburgh Chapter of the Organization of Chinese Americans will present the Pittsburgh Dragon Boat Festival on September 30. Join us at the Pittsburgh Dragon Boat Festival on September 30, 2018 for a day of fun at North Park Lake! Watch exciting races or form your own dragon boat and compete against other community teams for medals and awards. Cultural demonstrations, food, marketplace and other activities will be available, so bring the whole family to this FREE event! The event starts at 8:30 am and runs until 5:00 pm, with cultural demonstrations running from 11:00 am to 1:00 pm. It will be held at and around the Boathouse at North Park Lake in the North Hills (map) and is free and open to the public.